Irish music in the old ‘Sligo Style’ was carried far and wide by such migrant sons as Michael Coleman, Paddy Killoran and Michael Gorman. 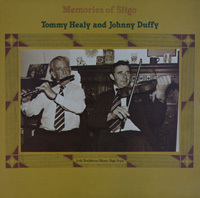 It was the tradition that two London based musicians – Tommy Healy (flute) and Johnny Duffy (fiddle) – grew up in. They continued adhering to the style playing at home in Ireland and later in London. Accompanied by pianist Reg Hall the two are beautifully captured on this intimate recording from the mid-1970s.